The Ghanaian organization we work for has just established norms for the length of translation programs — five years for the New Testament and 7 for the Old. These assume that the basic linguistic work like getting and alphabet and primer, have already been done. They also assume that all the right conditions have been met such as adequately trained translators with biblical training including at least one with who knows biblical languages; and adequate funding for all the translation activities and equipment. I have seen under-resourced translation programs drag on and end up costing more in the long term than if they had been well-resourced in the short term. 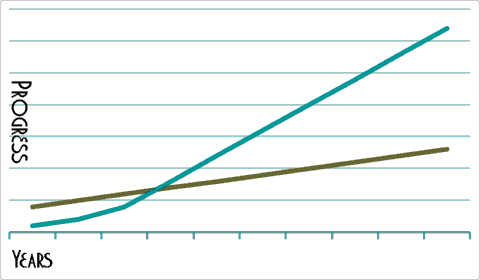 Translation does not progress in a straight line. That is, if it takes 5 years to translate the New Testament, the translation does not progress at the rate of one fifth per year. Rather, progress in the first year will be slow as the translators learn and as they solve translation issues that only need solving once then can be applied throughout such as how to translate “sin”. So we expect the translation to pick up speed as it goes along and at the same time to be better quality – clearer and more accurate. But there is a limit. The translation can only go so fast without the speed causing problems like poor translation accuracy. I’ve seen that first hand and more than once. On the other hand, translations that proceed too slowly also create problems. Local churches and international funders can get discouraged and stop their support, for example. I have seen cases where translation progressed so slowly that the translators became a joke in the community and no one would lend a hand or give money any more. Even getting the translation back on track was difficult because no serious person in the area wanted to be associated with such a sorry project. 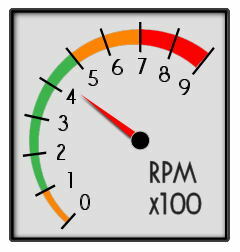 In this way, translations are like the speed (RPM) of large diesel engines. When they are pulling a load it is bad for them to go either too slow or too fast. So the operator has to keep them in a certain RPM range. Unfortunately, many Westerners like me who are involved in translation are (rightly) worried about translation going to fast and loosing quality, but we don’t seem to see the problems of going too slow. Just for comparison, it took the translators of the King James Version seven years to translate the whole Bible, but there were over forty translators divided into six groups each of which did part of the Bible. Also, they borrowed heavily from Tyndale’s translation which done only a few decades earlier. In fact, not a few passages in the King James translation are lifted directly from Tyndale with only minor changes if any. On the other hand, the KJV translators worked part time alongside their church duties. Nevertheless, doing a whole Bible in Ghana in 12 years with 3-4 full-time translators and no previous translation to draw on will push the limits in many of the languages where translations are still needed. If the new norms provoke efforts to see that translation programs have everything they need to progress well, they will be valuable even if they are not always met. This entry was posted in Acceleration, Bible translation, Ghana and tagged norms. Bookmark the permalink.